Zakiyyah is a bright, inquisitive 5 year old who loves riding her bike and is also currently learning to ice skate. She also loves playing football. Outwardly Zakiyyah looks like every other 5 year old and this is an issue that her family deals with constantly. 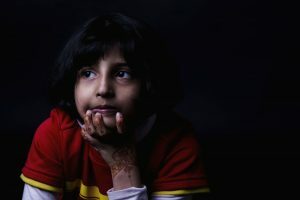 Zakiyyah has Tyrosinaemia Type 1, a rare disease that means she has problems breaking down an amino acid called tyrosine from the food she eats. In order for the body to use protein from the food we eat, it is broken down into smaller parts called amino acids. Special enzymes then make changes to the amino acids so the body can use them. Tyrosinemia 1 occurs when an enzyme, called fumarylacetoacetase (FAH), is either missing or not working properly. When FAH is not working, it cannot break down tyrosine. Tyrosine and other harmful substances then build up in the blood. One of these substances is called succinylacetone. When it builds up in the blood, it causes serious liver and kidney damage. It may also cause episodes of weakness or pain. When Zakiyyah came to the studio to take part in the Rare Project her parents explained a little more about her condition and the impact the diagnosis had on their lives. “After Zakiyyah was born we instinctively felt something was not quite right and went back and forth to the doctors. Her feeding was a real issue and she was such an unsettled baby. It was not until she was three months old we found out she had this rare condition which affects approximately 1 in 100,000 people. Tyrosinaemia is one of the conditions that is tested for as part of the heel prick test that is carried out on newborn babies. The way in which we found out about her condition was really hard for us. It is never easy getting a diagnosis but we were told on a Friday afternoon and we were given very little information. The consultant and dieticians who could give us the answers we needed were not available until the Monday and so we had a weekend of not knowing how this condition would affect our baby. It was terrifying. When we finally did see the consultant he was wonderful and explained everything clearly to us. Even though we have to carefully manage Zakiyyah’s diet it is a condition that can be managed. It was difficult getting used to the drugs and dietary changes to begin with. We have to monitor her intake all the time but it is surprising how much it becomes second nature. She is only allowed 5g of protein which is not very much at all. For example there is 12.5 g in an egg! We routinely check her tyrosine levels through blood tests and she has to take supplements and medication throughout the day.